Although the Holmes J83 0-6-0Ts of 1900 proved very successful, when more were required in 1909 it was decided to build something a bit larger. The result was Reid's Class A, which added a radial trailing axle to give an 0-6-2T. A total of 69 were built by the NBR between 1909 and 1920. 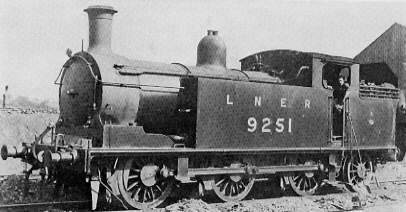 Ten more were ordered by the NBR but built after Grouping (1923), and the LNER built a further 20 in 1923-4. 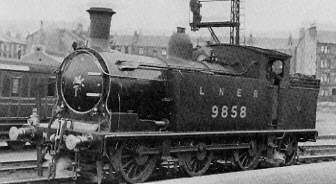 The first batch of six had a short cab and were designated Class N14 by the LNER. The remainder were classed as Class N15. In common with the N14s, the first six N15s were built with Westinghouse brakes and were hence given the sub-classification of N15/2. The N14s and N15s never experienced any significant rebuildings. New boilers were fitted between 1921 and 1950, and a number of small reductions in boiler tubes were recognised. The original boilers were quoted as having 252 tubes, but the diagrams were amended in 1923 to list 240 tubes, and in 1938 to list 237 tubes. During the coal strike of 1921, Nos. 859 and 860 had oil burning apparatus fitted. A third conversion was planned but never carried out, and the apparatus was removed from Nos. 859/60 after a few months. The first three N14s were delivered to Eastfield to provide assistance on the Cowlairs Incline. The next two were allocated to Burntisland to haul coal traffic in Fife. The last (No. 863) was allocated to St. Margaret's in line with NBR practice of the time of having goods engines with continuous brakes at strategic points for emergency passenger work. It is interesting to note that this practice has been recently adopted by the modern post-Privatisation railways with their "Thunderbird" rescue locomotives. The two Burntisland locomotives were moved to Eastfield in 1912. The Eastfield N14s would work the Cowlairs Incline for the rest of their lives. In 1925, No. 863 (now No. 9863) was moved to Haymarket for further emergency work, before being allocated to Kittybrewster for shunting from 1927. The N15/2 locomotives were initially distributed to St. Margaret's, Thornton, and Eastfield. Duties varied, but included the North Leith branch goods, coal trains, and occasional local passenger work. Three of these engines had moved to the Cowlairs Incline by Grouping (1923). The 93 N15/2 locomotives were widely distributed throughout the NBR system. Duties included taking coal trains from the Lothian pits to the Edinburgh docks, heavy yard shunting, Edinburgh-area transfer goods, local pick-up goods, and incline pilots. Mainline pick-up goods trains had been tried before Grouping, but this proved to be impractical due to the N15's relatively limited water capacity. By 1935 the N15/1s were allocated to Eastfield (21), St. Margaret's (17), Parkhead (16), Thornton (7), Dunfermline (8), Kipps (8), Bathgate (7), Polmont (3), Carlisle (3), and Haymarket (2). The Eastfield N15/1s were mainly used as incline pilots - especially for passenger trains up the 1-in-42 gradient through Cowlairs Tunnel. A typical day would have seven N14s or N15s allocated to this duty. During World War 2, St. Margaret's allocation was increased to provide pilots for the newly re-opened Meadows Yard. The first three N14s were withdrawn in 1947. The remaining 96 locomotives entered British Railways ownership (1948). Although most of the remaining N15s stayed on ex-LNER rails, some were seen at ex-LMS sheds such as Balornock, Dalry Road, Hamilton, Motherwell, Polmadie, and Dawsholm. Eventually the introduction of diesels took their toll, and the last N15 was withdrawn in 1962. The last N14 had being withdrawn eight years earlier in 1954. The N14s proved to be very useful engines and worked a very hard life. It was often noted that in a busy yard they appeared to be in perpetual motion - barely stopping to let a shunter hop on or off. The following details are for the N15/1 locomotives. The N14s had a shorter cab and steam brakes, resulting in a slightly heavier locomotive of 62 tons 19 cwt, with a maximum axle load of 17 tons 4cwt. The extra weight was due to an increase in coal and water capacity afforded by the smaller cab. The N15/1 locomotives had Westinghouse brakes, but the N15/2s had steam brakes and weighed 62 tons 1cwt. Heating Surface: Total: 1309 sq.ft. The last N14 was withdrawn in 1954, and the last N15 was withdrawn in 1962. Neither survived into preservation. Falcon Brassworks sell a 4mm kit of the N14. Bill Bedford produces a body kit of the N14 for 4mm scale. A 4mm scale resin body kit of the N15 is also available from Dean Sidings. 62C Models of Dunfermline sell 7mm scale (O gauge) kits of both the N14 and N15. Redcraft also sell a 7mm kit of the N14.